A recent survey conducted by Lux Insights, Inc. puts consumer awareness of Bluetooth wireless technology at 92 percent globally, with 62 percent of respondents reporting a purchasing preference for Bluetooth enabled products, noting Bluetooth is reliable, easy to use, and makes life easier. The proliferation and success of Bluetooth captured the imagination of the consumer, leading to increased demand for unique wireless applications, most notably home automation, location-based services, personal monitoring and tracking, and remote access control. Industry analyst ABI Research projects that over three billion Bluetooth enabled products will ship this year alone. Demand for IoT connectivity is focused in areas where consumers need additional control and insight. Respondents reported the highest interest in location awareness applications (solutions that aid first responders in emergency situations or aid navigation in public spaces and buildings), home automation (controlling lighting, locks, temperature from inside and outside of the home), and personal monitoring (securing monitoring and sending sensitive health and wellness data). Regional breakdown of survey findings will be covered athttp://blog.bluetooth.com. For additional information on Bluetooth technology, visit www.bluetooth.com. 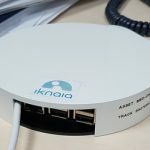 Iknaia specialises in providing intelligent location based technology that uses low-cost sensors to locate critical assets and people and records environmental data. Our vision is to provide a completely ‘Connected Environment’ that will enable our clients to focus on providing the best quality of service, whilst our technology provides an efficient workplace for everyone involved. Got a question? Get in contact with us, we would love to hear from you.